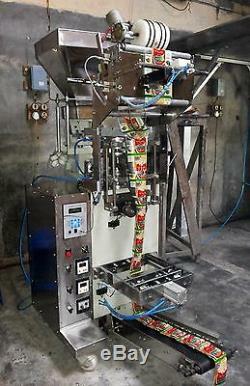 Cup Filler based Pouch Packing Machine. (Automatic Half Pneumatic Type FFS Machine) are suitable to pack free flowing powders & granules like glucose powder, semolina, instant drink powders, ors powder, seeds, tea, sugar, instant drink powders, mouth freshener, puffs, namkeens & pulses in center seal pouches. 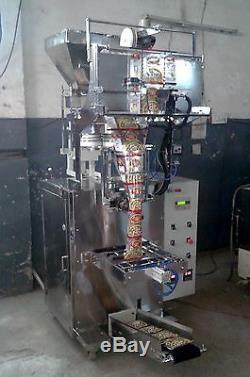 These machines are available in many different size and specifications as per the client requirements. 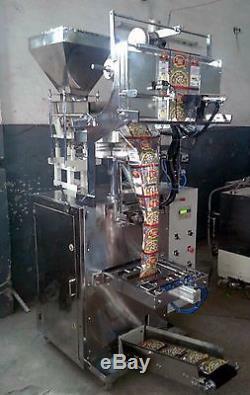 AUTOMATIC HALF PNEUMATIC TYPE POUCH PACKING MACHINE WITH VOLUMETRIC CUP FILLING DISC. For easy unwinding of laminate roll. Any continuous heat sealable laminate in roll form. C 50 HZ Single Phase Motor. 220VAC +/- 10%, 2.75 Kw approx. Photo Cell Eye mark Sensor. Note: Cups & forming chuit for Rs 5.00 pouch size will be accompanied with basic machine. V Pneumatic Batch coding unit. Given price offer is FOB India port bases after custom clearance. (Equipment will be supplied in sea worthy wooden pallets). The customer shall deliver the following items for trial of the machine at our works. Laminate roll /Packaging material At least 3Kg. Sufficient quantity of each of the products proposed to be packed. We take trials at our works before dispatch of machine to fine tune & ensure trouble free. Customer representative may have to reach our works as per. The dates communicated by us to them. Customer is requested to keep ready the prerequisites/ utilities/ accessories at site prior to arrival of our service engineer. Air ticket to & fro + Lodging, boarding (International standard), local conveyance & USD 60.00 per day per person as pocket allowance for Installation Engineer. Air ticket to & fro + Lodging, boarding (International standard), local conveyance & USD 60.00 per day per person as pocket allowance for service engineer. These all machines are customized and we have to manufacture the machine exactly as per customer requirement. So we need following information from customer side in order to initiate the manufacturing process. Quantity/weight/volume to be filled in per pouch.... (3 side/ 4 side/ center seal). 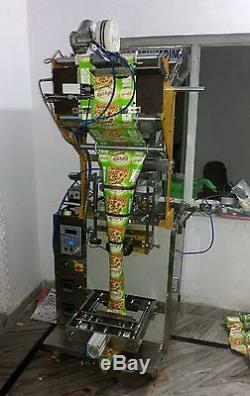 Batch coding unit to print MRP, LOT no. & Packing Date (Required or not). Production capacity required Per Hour..... 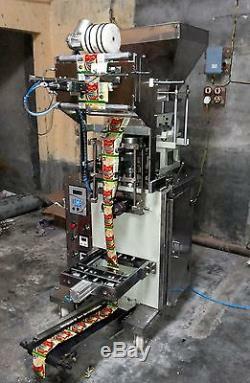 The item "Popcorn packaging machine, Pneumatic type FFS with cup filler" is in sale since Saturday, August 26, 2017. This item is in the category "Business & Industrial\Material Handling\Packaging & Shipping\Filling & Sealing Machines\Sealers & Sealing Machines".